The Electrolux central vacuum power nozzle is what cleans your home and agitates the carpet in order to more thoroughly remove dust and dirt. These power nozzles are usually electrically powered by high voltage wiring in the electrolux central vacuum hose, but can also be powered by the suction of the central vacuum itself. When you’re considering if you get an electric or air driven Electrolux central vacuum power nozzle you want to be aware of how much carpet you have vs. hard floors. It is essential to purchase the right power nozzle package to properly clean your home. If you have atleast 25% carpet in your home it always recommended you go with an electric power nozzle, which you can find here. These electric power nozzles do a much better job of agitating the carpet while cleaning it, rather than just surface cleaning the dust and debris that you see. This agitation actually causes the microscopic dust and dirt to rise from deep in your carpets and be sucked up into the central vac. Other power nozzles that use the suction of the central vacuum to power their brush rolls just do not do an adequate job at deep cleaning the carpet. The nice thing about replacing an Electrolux power nozzle is that there are many options with what you can replace it with. Since beam was bought out by Electrolux in the last decade, a lot of their products have become similar and interchangeable. 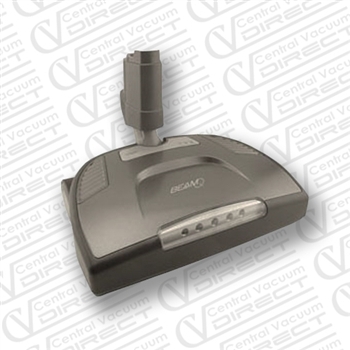 New Electrolux central vacuum power nozzles use the exact same head as the beam q. This makes it easily and readily available to anyone looking for a replacement product. Repairing this Electrolux central vacuum power nozzle can be tough though. There are a lot of tiny parts that are located inside the power nozzle housing. This does not mean that a “do it your selfer” cannot work on these though. All the parts for these power nozzles are available from centralvacuumdirect.com at competitive prices. This entry was posted in Electrolux Central Vacuum. Bookmark the permalink.